Following data encryption, the virus then leaves DECRYPT_YOUR_FILES.HTML ransom note which starts with a line Attention! All your files have been encrypted. You can stop this unwanted process initiated behind your back with the help of Ctrl + F4 combination. Due encrypting was used algorithm RSA-4096 and AES-265, used for protection military secrets. That means RESTORE YOU DATA POSIBLE ONLY BUYING decryption passwords from us. 1. Send Your ID_KEY on mailbox. 2. For test, decrypt 2 small files, to be sure that we can decrypt you files. 3. Pay for our services. 4. GET software with passwords for decrypt you files. 5. Make measures to prevent this type situations again. Do not try restore files without our help, this is useless, and can destroy you data permanently. However, the files can be recovered even after the removal of our program and even after reinstalling the operating system. Unfortunately, crooks are not lying. 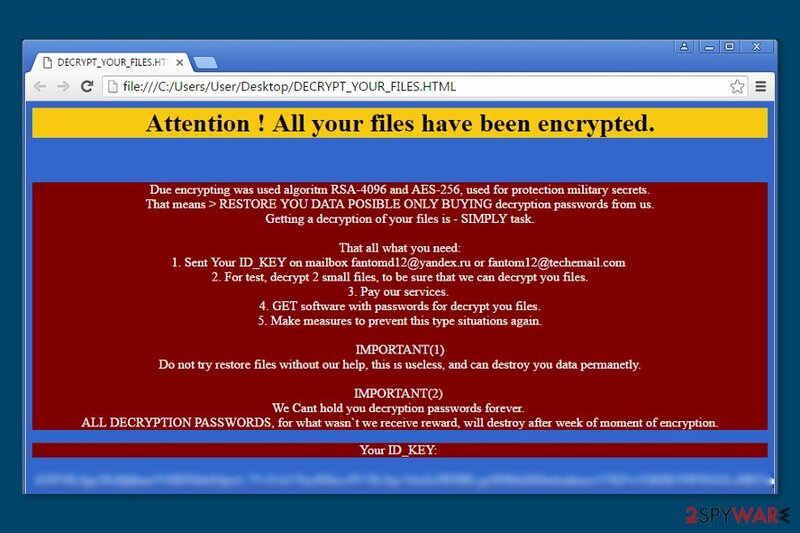 Fantom ransomware relies on an advanced military-grade encryption system. This system relies on a public encryption key, which is used to encrypt files, and RSA encryption used to protect the first key. This key is the life saver for those who want to decrypt .fantom file extension files; however, cyber criminals are not willing to give it up for free, so you should not wait for their mercy. 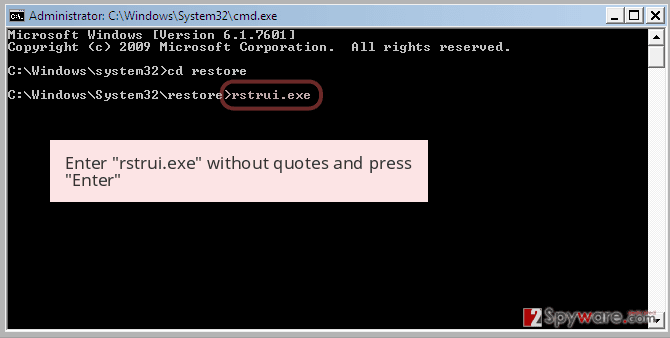 The threat can set a different size of ransom according to the title of the executable. Thus, the cyber criminals gain the chance to earn different sums of profit employing the same executable. For example, if it contains a certain number, let's say, fantomv2.exe, you will be required to pay 2 Bitcoins. In the case or ransomware attack, we would like to encourage you not to pay the ransom. Files can be retrieved from a backup, but before you plug it into your PC, remove Fantom ransomware first. It helps to clean the system and prevent further possible cyber attacks. We understand that everyone wants to keep their precious files safe and sound, and that is why we always urge users to create their copies and import them to external devices – in other words, to back them up. Data backups come in handy when the original ones get corrupted, encrypted, or deleted by malware. Security experts do not advise users to mess with ransomware viruses manually because these malicious programs are designed to hide deeply in the computer system, and they typically consist of many files. The best way to recognize and delete them all is to allow an automatic malware removal tool to do it. Fantom removal can be finished using the Reimage. This ransomware operates in a rather crafty way. As we have mentioned in the first paragraph, this ransomware manages to deceive a user and pretends to be a Critical Windows Update, asking the victim not to turn off the computer. In the meantime, the ransomware rummages the compromised system, searching for predefined file types. It scans the computer and encrypts precious memories, work files, and other important documents, leaving no chance to restore and use them. It bypasses essential system files to keep the computer running, creates a ransom note, changes desktop wallpaper, and opens the delback.bat file. If the victim is not the administrator, a pop-up dialog will show up, asking the victim to make changes on the device. Since this message says that it comes from a verified publisher – Microsoft Windows, inexperienced victims might unknowingly click Yes. This deletes Shadow Volume Copies, which can help you to recover encrypted data. Fantom ransomware shows fake Windows update screen. Meanwhile, it encrypts files. On March 2017, malware researchers spotted a new version of ransomware. The unique feature about this variant of Fantom is that after the infiltration, malware checks computer’s location. If it finds out that it ended up in Russia, it discontinues the attack. Otherwise, it starts data encryption procedure and appends a specific file extension based on the timestamp of the contamination event. One month later, on April 2017, security community started talking about the possibility that Fantom RaaS might show up soon. Researchers find an improvement in ransomware’s code that allowed assuming that authors of the ransomware are about to launch RaaS platform. However, it seems that this day hasn't come yet. However, the same month Fantom ransomware changed its design. Virus researchers have detected a brand new version of this threat. The hackers of this peculiar malware noticed that it contains major improvements in its source code and execution manner. As a result, they lead to alternations in its veneer as well. In contrast to previous versions, it appends a different file extension. Now all encoded files contain .11232323 file extension. Payment guidelines are also presented in a different file RESTORE-FILES.11232323.hta. Besides this file, it also loads additional two images hxxp://iplogger.ru/1qzM6.gif and hxxp://iplogger.ru/1wzM6.gif to inform about the hijacking process. Interestingly, that the malware also locates the country of victims' residence. According to the initial report, the malware terminates itself if a victim is Russian. No major changes in its distribution process are reported. Avoid clicking on suspicious ads, links or buttons. Bypass clicking on ads or articles with click bait titles. Never open email attachments that unknown people send to you. No matter if the attachment is named as invoice, resume, phone bill, or similarly, it does not necessarily mean that it is a safe file. Vice versa – crooks tend to name malicious attachments exactly like that because their aim is to make the victim feel safe about the file and open it without even thinking about potential hazards. Try to avoid opening files that your computer system identifies as potentially dangerous, and keep a proper anti-malware software installed on your computer. You have to clean the computer from malicious files completely; otherwise, any malicious files left behind can make your system vulnerable to further ransomware attacks and cause computer malfunctions. Fantom removal must be completed using a powerful software, such as Reimage or Plumbytes Anti-MalwareMalwarebytes Malwarebytes, that can remove viruses. 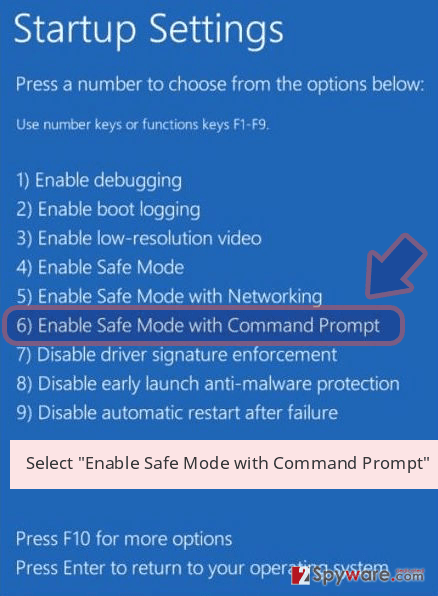 The virus might attempt to stop you from running security programs, so in such cases, follow instructions provided below. They will help to disable the virus and remove Fantom with the help of security software. 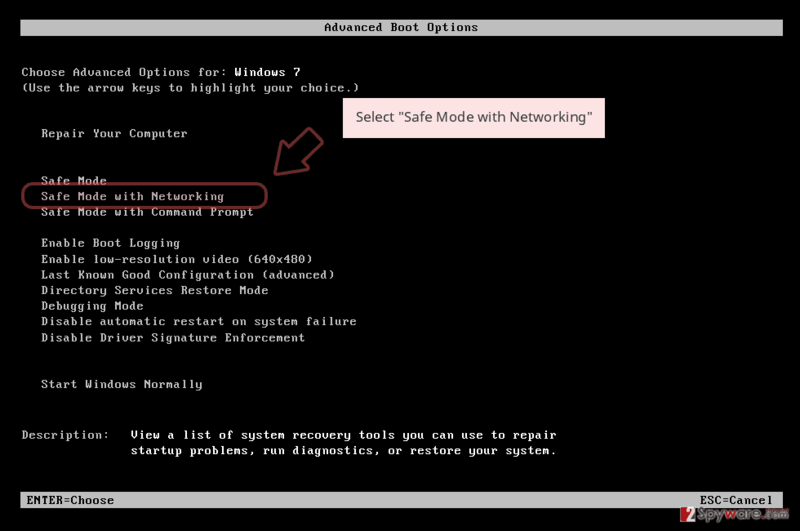 If your scanner is blocked, try rebooting your computer to Safe Mode with Networking before a full system scan. Once you finish it, you should check your computer when in normal mode as well. Log in to your infected account and start the browser. Download Reimage or other legitimate anti-spyware program. Update it before a full system scan and remove malicious files that belong to your ransomware and complete Fantom removal. 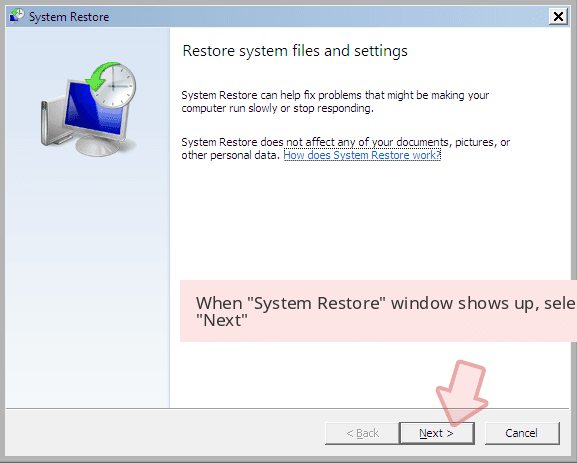 If you can't launch your anti-spyware, you can try System Restore method to disable the virus. However, don't forget to remove its files from the system after disabling your virus. 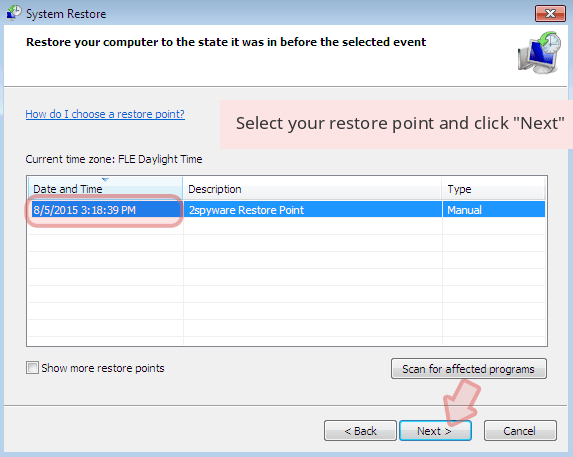 When a new window shows up, click Next and select your restore point that is prior the infiltration of Fantom. After doing that, click Next. Once you restore your system to a previous date, download and scan your computer with Reimage and make sure that Fantom removal is performed successfully. 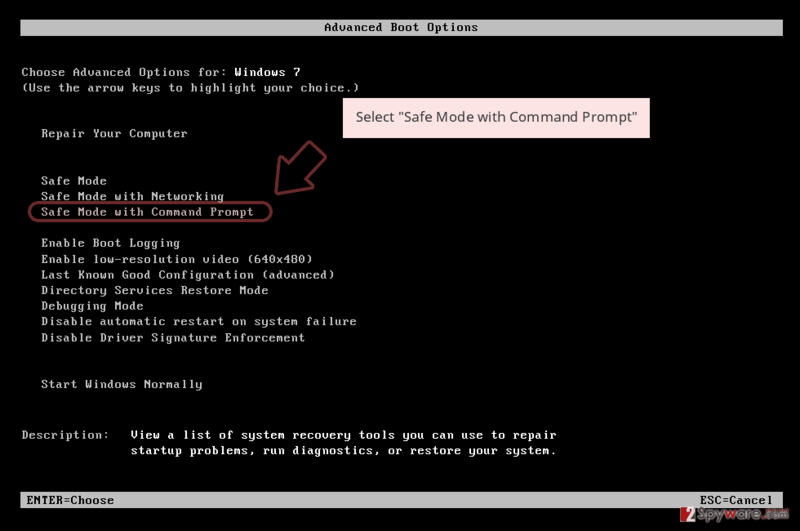 Guide which is presented above is supposed to help you remove Fantom from your computer. To recover your encrypted files, we recommend using a detailed guide prepared by 2-spyware.com security experts. Please, do not support frauds by paying the ransom. Keep in mind that cyber criminals might send you a useless piece of software that cannot help to recover your files. 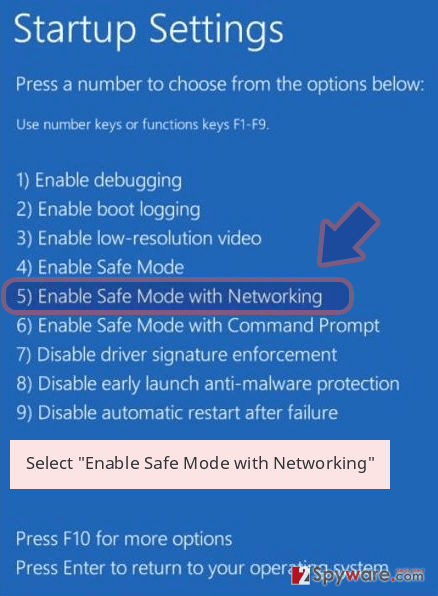 Besides, it can be filled with malicious components allowing crooks to exploit your computer system even more. If you have lost your precious files, try recovering them from a backup or use one of the methods listed below. To recover your files, we recommend using Data Recovery Pro program. It might help you to restore your lost data. We definitely think that it is worth a try since a free and official Fantom decryption tool hasn't been released yet. If you have a few exceptionally important documents you have to recover, we recommend using Data Recovery Pro. This program helps to retrieve individual files, besides, before you use it, remember that it can help you only in case you have enabled Windows Previous Features feature in your PC. ^ Warning! Ransomware posing as critical Windows update. SGCyberSecurity. Singapore’s leading cyber security portal. ^ RSA (cryptosystem). Wikipedia, the free encyclopedia. ^ Why you shouldn't pay the ransomware fee. CSO Blog. Backup and recovery. ^ MICHAEL MUCHMORE. The Best Online Backup Services of 2016. PCMag Reviews. ^ March 2017: The Month in Ransomware. Tripwire. Advanced Threat Protection & File Integrity Monitoring. ^ April 2017: The Month in Ransomware. Tripwire. Advanced Threat Protection & File Integrity Monitoring. This entry was posted on 2017-07-24 at 08:26 and is filed under Ransomware, Viruses. How did you remove Fantom virus?